Over at The Intercept, they have a a great article on the Drone war. Surprise, the official line is not exactly in line with the truth. If you want to work towards fighting this illegal war, you can join forces with the national office. It is the plan of our governments, the military, and industry, to use drones and robots as weapons of choice as well as tools for increased domestic surveillance. The number of drones being designed, manufactured, and purchased increases the number of installations and, potentially, the fatalities and injuries of the innocent. As the government pursues its plans to fully open US airspace to drone traffic, the safety of those in private and commercial planes will also be compromised by these stealth weapons, undetectable by design. Under the Obama administration, the use of drones as weapons has increased dramatically, with serious legal, moral, and philosophical implications. Surveillance drones, which could become weaponized, create concern for our privacy and freedoms when deployed in US airspace. Become knowledgeable about drones and related weapons. Educate ourselves and the public about the issues created by the use of drones and robots as weapons and surveillance tools. We can do this through publications, press releases, vigils, marches and direct actions at home and abroad. End the development, production and use of these weapons through coordinated efforts with other like-minded groups and individuals by conducting actions at drone facilities, research sites, and drone manufacturers. Defend our right to privacy and freedom by banning information-gathering of citizens and others, by drones, and advanced surveillance systems. VFP members all over the country (and the UK!) have been heavily involved in anti-drone activities for some time now, and the working group will attempt to better coordinate and publicize the work that is being done. Recently, several members of VFP attended the second “Drones Summit” in Washington, DC. Over 300 people participated in the 4-day event, which began on Friday, November 15th with a rally and march from the White House to the offices of General Atomics. Saturday and Sunday were filled with panel discussions, presentations, workshops, strategy sessions and networking, and many folks stuck around for a lobby day on Monday. 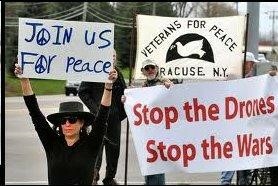 There was also a direct action resulting in four arrests on Monday at the office of Senator Chuck Schumer, an outspoken advocate of combat drones. For many of the attendees, a highlight of the Summit was listening to the first-hand accounts of three Yemeni drone victims who had traveled all the way from Yemen to tell us their stories and to present a briefing to Congress. One of the action items resulting from the summit was the plan to create an international coalition against drones, particularly armed drones. A website will be created to coordinate the activities of the coalition. If you would like to be a part of the Drones Working Group, or if you are doing anti-drone work that you want us to know about, please contact Leah Bolger (leahbolger@comcast.net) who has recently taken the reins as the chair of the Drones WG. Educate yourself. Read Medea Benjamin’s book, Drone Warfare. Educate others. Talk to your friends and neighbors about what you have learned. Invite a speaker to your town. Look into the organizations and websites listed in the resources section to find a speaker. Obtain a scale model drone, available through www.knowdrones.org Use the model to educate the public and/or have a die-in using the model as a prop. Download fact sheets or informational fliers and pass them out. Find out what drone manufacturers or drone bases are near you. Write Letters to the Editor. The opinion page is the second-most read page of the paper after the front page. Join or support organizations that are doing anti-drone work. Write or visit your Congressman and tell him/her of your concerns about drones. Discuss the moral and legal aspects of drones in your church group or discussion group. Have a drones teach-in; many videos are available on-line. Discuss the “Living Under Drones” report.